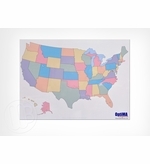 OptiMA has created an entire line of printed dry erase maps of the U.S.A. 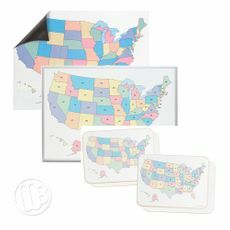 These OptiPrint™ dry erase maps have a superior dry erase writing surface that wipes clean and won't ghost. 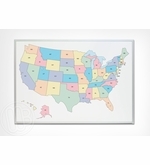 Our selection includes wall mounted, framed dry erase maps in both magnetic and non-magnetic receptive formats. We also offer printed student lap boards and a roll up magnetic print to use in conjunction with your magnetic whiteboard or chalkboard or really any smooth steel surface. 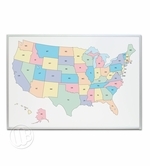 Custom printed dry erase maps are also available through our own, in house graphics division. Framed 32" tall x 45 ½" wide - Ships UPS. Colorful Handheld Map on 1 Side, White on Reverse.